If your team loses a game but you play exceptionally well, are you happy afterward? Or if your team wins but you performed very poorly, are you significantly disappointed? So in other words, what is more important to you… your personal performance or the success of the team? I remember when I first heard those questions, mostly because it gave me a clear view in the mirror of my motivations for one of the very first times. I knew my truthful answers, and they weren’t ideal to say the least. For the greater part of my career as a basketball player, I was unknowingly focused on myself in a very unhealthy way. And while lots of different factors played into this “island” mentality of self-focus, one significant issue that took up its fair share of my problem was that I viewed everyone around me exclusively as the competition. As messy as this “me against the world” mentality may be, I suspect that I’m not alone in having dealt with it on some level or another. Whether this is verbalized or communicated between the lines, many athletes, coaches, and programs can tend to view their opponents, or even their own inner circle of teammates and colleagues, through little more than the lens of competition. Although this may characterize how things have been done in athletics for many years, I believe a better alternative is very close by — one that causes less stress, saves energy, and builds deeper relationships with the people around us. When we allow our co-competitors to move from competition to community, we are living proof of what it truly means to be better together. There are a few reasons we’ll look into more closely, but during this fun season of March Madness, we might as well look at what one of the greats is living out in this area. One would think that a successful coach like Geno Auriemma would want things to stay exactly as they are. After all, he’s the most successful coach in the University of Connecticut’s program history. He’s led his team to 11 NCAA Championships, 19 Final Fours, six overall perfect seasons, and more than 1,000 career wins. In an interview for a 2014 issue in the NCAA Champion magazine, he said, “The best time to make changes is when you have a pretty good thing going on, and you just want to make it better.” That has characterized Coach Auriemma’s desires for women’s basketball, and it brings us to the first point of discussion. When competition becomes community, we’re free to consider the needs of others. When competition becomes community, we’re free to help others grow. Again, with UCONN’s record being what it is, you wouldn’t think Auriemma would be actively seeking to change his team’s powerhouse situation whatsoever. However, he has shared openly that he desires the game itself to continue growing and developing. After a recent loss to Louisville in an away game in January, Auriemma said, “The sport of women’s basketball needs these games. ESPN needs these games,” as he celebrated the overall improvement of both the game itself and the fact that other teams were improving. When competition becomes community, any attention received is helpful to the entire group. Coach Auriemma has seen this play out. A champion in many rights, his outward focus on women’s basketball as a whole is no exception. 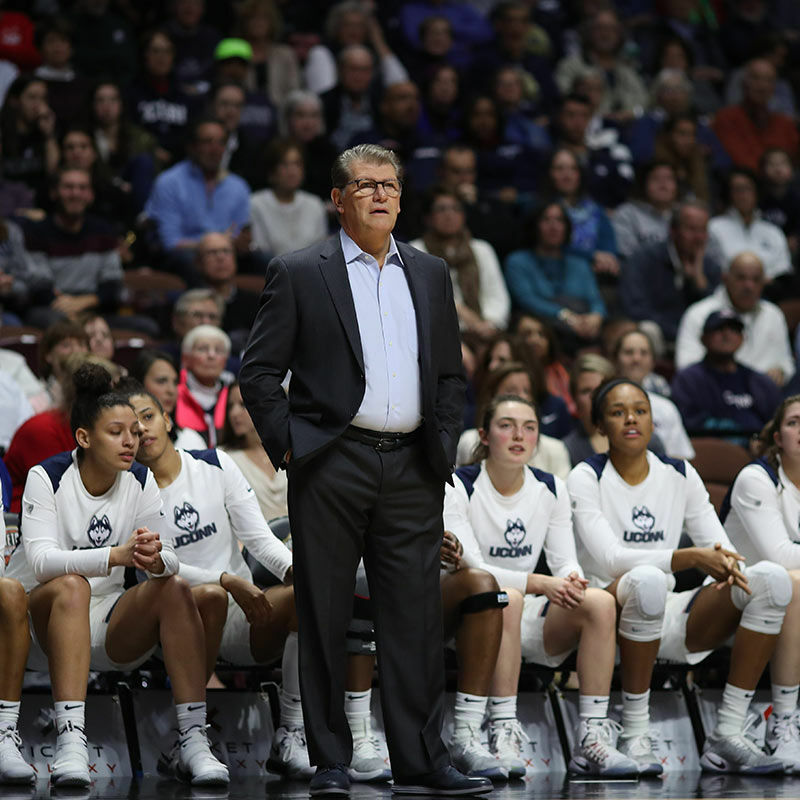 Though his team was upset in the Final Four last year by a game-winning, overtime buzzer beater from Arike Ogunbowale of Notre Dame, the obvious disappointment to the surprised UConn team was simultaneously a wonderful fulfillment of Auriemma’s hopes for the game. After years of sharing knowledge with intentional collaboration among high-level coaches, we are reaching an exciting point in women’s basketball where we are seeing widespread improvement and more of an “anybody’s game” situation. Upsets are becoming more common, and the thought of mid-majors having a genuine shot at making postseason runs is by no means outlandish. The elements of excitement and mystery when it comes to speculating about which teams will be victorious is bringing growing attention to the game, and we are seeing overall better basketball at the collegiate level. That is worthy of being celebrated. Finally, when competition becomes community, we’re free to learn from the success of our co-competitors. There are some givens when it comes to programs like UConn, Baylor, and Notre Dame — they obviously have a number of resources available to them that not everyone enjoys. However, they don’t simply have money and nice facilities. These programs are doing something right, and there is a lot to learn from them. If we maintained a self-focused mentality, we could find any number of reasons to hate on these teams. If we shifted our focus and put on the lens of community, we would be wise to acknowledge and learn from those in our fields who are consistently seeing success. This shift to a unified community points to something even greater than athletic togetherness. In John 17, in what is known as the “high priestly prayer “Jesus asks the Father for unity among believers. He prays in verse 23, “that they may become perfectly one, so that the world may know that you sent Me and loved them even as you love Me.” Shifting from competition to community alone is a healthy practice, but this is an area of our lives where we have the opportunity to point to the love of our Heavenly Father who sacrificed his Son to bring ultimate unity between Himself and humanity. As we continue to move from competition to community, we will show others another picture of the love of our Father, and we will all get better together.